Hey BBP! fans! Lenzi here again, and it's officially October, the scariest and darkest month of the year, and my personal favorite. What better way to launch it than with a new product from our 'Dexter' license? Angel Batista, member of the Miami Police Department and the closest thing Dexter Morgan has to a true friend, has now been added to the growing cast of bobble heads we're making for Showtime's hit series 'Dexter'. 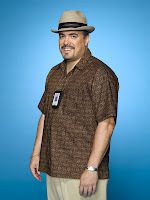 Featuring a stunning likeness of David Zayas (right down to his signature head gear), we think he makes a fine companion piece to the already hugely popular Dexter bobble heads you fans are loving so much. He's available RIGHT NOW for pre order, so hurry on over and get in line! The third season just started (and is Showtime's highest rated season premiere in history!) and there are more 'Dexter' characters on their way. When you see 'em, trust me- you'll want the whole set!